Friday December 17th 1920 I was busy with Christmas work all spare time. I did up candy for Sue & Sallie Reed and Aunt and Ida. I was in town shopping in afternoon. 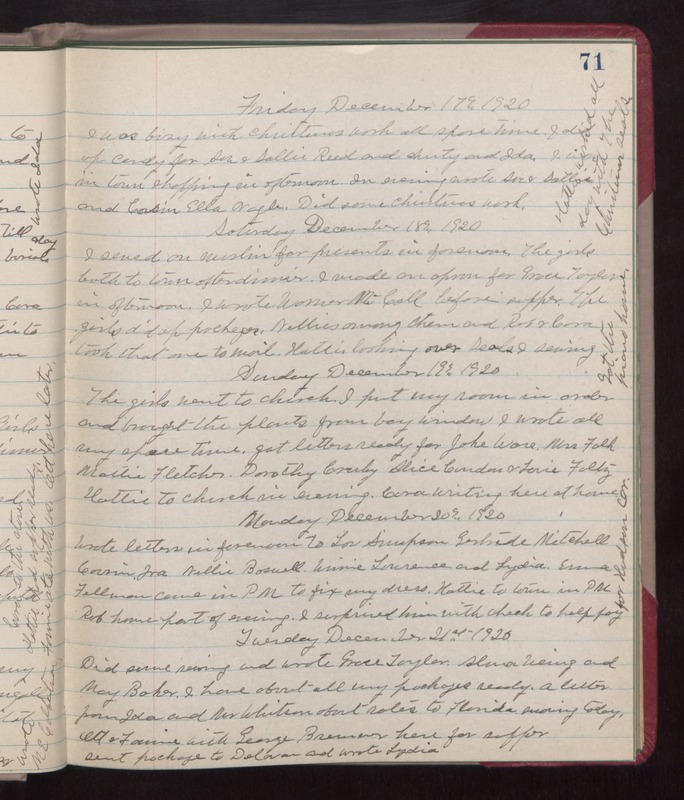 In evening wrote Sue & Sallie and Cousin Ella Nagle. Did some Christmas work. Hattie worked all day with The Christmas Seals. Saturday December 18th 1920 I sewed on muslin for presents in forenoon. The girls both to town after dinner. I made an apron for Grace Taylor in afternoon. I wrote Warner McCall before supper. The girls did up packages. Nellies among them and Rob & Cora took that one to mail. Hattie looking over Seals. I sewing. Sunday December 19th 1920 The girls went to church. I put my room in order and brought the plants from bay window. I wrote all my spare time. Got letters ready for Jake Ware, Mrs Falk, Mattie Fletcher, Dorothy Crosby, Alice Condon & Lorie Foltz. Hattie to church in evening. Cora writing here at home. Monday December 20th 1920 Wrote letters in forenoon to Lou Simpson, Gertrude Mitchell, Cousin Ira, Nellie Boswell, Winnie Laurence and Lydia. Emma Fellman came in P M to fix my dress. Hattie to town in PM. Ron home part of evening. I surprised him with check to help pay for Hudson car. Tuesday December 21st 1920 Did some sewing and wrote Grace Taylor, Alma Weing and May Baker. I have about all my packages ready. A letter from Ida and Mr Whitson about rates to Florida. Snowing today. Ott & Fannie with George Bremner here for supper. Sent package to Delavan and wrote Lydia.